Been a long few days, hey? The pictures of the devastation in Haiti have been moving, the numbers staggering and the task at hand feels overwhelming. Feels like déjà vu. This week was a whirlwind of emotions. Any trip, especially one establishing new ground for Team Broken Earth, is always filled with adventure, uncertainty, challenges, and rewards. The highest of highs and the lowest of lows. This trip to Nicaragua was similar in its experience, but different in that the emotions were magnified with a background lens of hurricane Matthew and our friends in Haiti. The clinic in Nicaragua was a huge success. We treated over 200 patients a day. 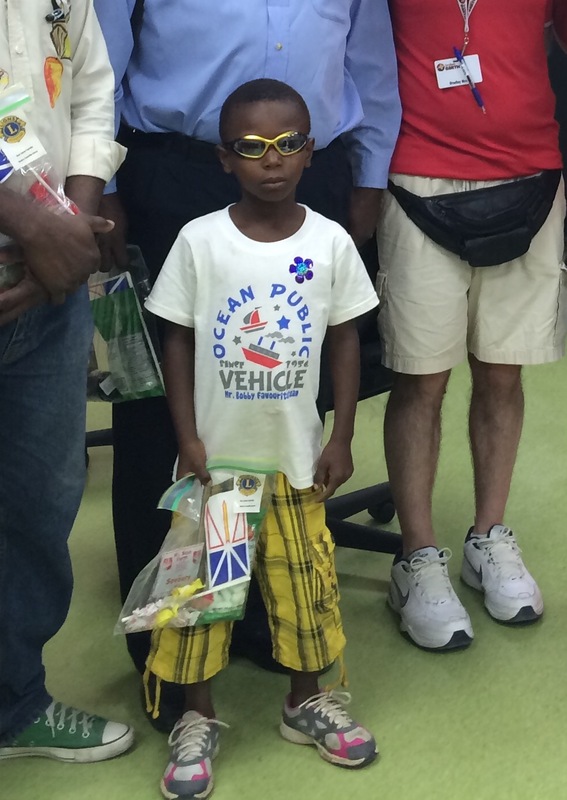 The partnership with the Lions Club and the vision clinic changed lives at a rate of 100 per day. Attached to the clinic was an orphanage-style home for the blind children of Chinandega, where there were 10 full time children being taught how to use brail, play instruments, and given a safe place to live, learn and grow. At the hospital, there was a special moment when an elderly lady came to have her eyes cared for with her daughter at her side. She had not seen her daughter clearly for years and after being assessed by the vision team, she was handed a pair of glasses and asked by her daughter if she could see. The woman cried, saying through a translator, it was the first time she had seen her daughter clearly in years. There was no need for translation, the tears of joy in each of them was enough for anyone in the room. I remember someone once talking about the Butterfly Effect. I believe it’s about the origin of effect. That if a butterfly flaps its wing in Brazil, it can cause a Tornado across the globe. Or something. I’m the wrong kind of doctor for that question. But I wonder if the same can be said for the hope in the eyes of a patient? Can hope ripple across the globe? God I hope so. The truth is a challenge for us all. The real tragedy in Haiti is that after the reporters leave and media reports settle, the real need will still be there. The news all day is all about the latest bombshell in the American election. Third story in on the news is how the death toll in Haiti is now over 900. I’m not sure what tiny thing sparked what would become hurricane Matthew. But the aftermath? I know it will be worse than I imagine. As I sat in the sweltering, humid heat of Nicaragua, watching Broken Earth members place eye glasses on the face of a patient creating a smile, I could not help but think that this smile, this is hope, and that hope will, as Robert Kennedy suggested ripple throughout the world. That despite the disaster in Haiti today, they will feel the ripple from the smile in Nicaragua for them well into the future. The Haitian now struggling for food and water, battling cholera, and looking for shelter, needs that ripple to grow larger and quickly. The family with nowhere to lay their heads tonight needs the ripple to hit them with greater force than Matthew. This is where we all can help. Maybe the hurricane is a wakeup call. A reminder. Something that says we are all in this together. That yes, the need is again great. But the will to change it will always be greater. When just a little is enough sometimes. It has been a while since I have written a blog. To be honest, I had lost my appetite for it. It’s tough to admit but my motivation was and has been so challenged as of late. Haiti. I despair that it’ll never catch a break. The lack of political stability there, although not making headlines anywhere, is so troubling. This is not a political blog. Won’t ever be. I believe Broken Earth is independent of political parties and elections, but we operate in an environment that is up to its neck in it. The patients we serve, as if they don’t have it hard enough, are drowning in it. The sad truth for us is that we only move in this environment. We visit it a week at a time. I know this is a selfish view. Why? Because Haitians have to live with this every day. Haiti has not had a recognized election result this year. Because of this, the country has been in a state of flux and without a democratically elected government for eight months now. Where’s the outrage? Can you imagine if Canada, the US, or other democratic governments in the international community were allowed to continue to control taxes, health care, and law and order this way? Somebody would say something for sure. But not here. Of course this affects us very little at home. Other than the disruption of having to rearrange trips and move equipment, it is merely an inconvenience. But do we have a greater responsibility? Are we not supposed to be advocates for our patients, for those in need? I had hoped the elections would come and go as they are supposed to and that the results would be sanctioned and that there would be no CNN headline, and no incident to warrant a report. I was equally gutted with the deliberate, horrific attacks in Bangladesh and Istanbul. Broken Earth had recently stayed for a full week only a kilometer from where the Dhaka terror attack had happened. Dhaka is an immense city, a mega city, and despite its size and the mass of humanity, I had never felt unsafe. Crowded, yes, suffocated, yes, but never unsafe. The people of Dhaka, despite the hand they have been dealt, have gigantic hearts, and are some of the kindest people I have ever met. The attack in Dhaka struck me hard. The attack on an airport in Turkey also caused me to pause and reflect on the madness that exists, the evil that is lurking. En route to Dhaka, we spend full days in that very international Turkish terminal, waiting for a connecting flight. The images on the TV were geographically familiar. Frightening and troubling but again seen through a selfish lens as I write this in the comfort of my home. All of these near misses made me reflect and pause for thought. I thought about stopping. I thought about quitting. I thought about forgetting about it all and going back to just practicing orthopedic surgery in the comfort of St. John’s. But I can’t. Too many images in my head that together pick me up and carry me forward. The faces of the patient in the corridor in Haiti. The eyes of the young boy smiling in the streets of Dhaka. I won’t let this attitude defeat me. I can’t. I think each of us carries a candle inside. Sometimes it flickers, grows weak. We all have to tend that light. It’s what keeps us going. If we’re lucky, it’ll burn bright enough for others. And they can see a little bit of hope. Just a little is enough sometimes. Again and again I come back to the team for inspiration. Broken Earth is planning a full slate of missions for the fall in Haiti. We have had to postpone two and reroute one. The one team I am a part of will be heading to Nicaragua instead of Port au Prince and hopefully light the flame of hope there as well. We are also expanding our reach to Guatemala. I will be travelling there in September to hopefully set up a clinic, help lay the foundation to build a clinic, and establish the potential for future non-medical education to the impoverished people outside of Guatemala City. In addition we are concentrating our efforts at home as well. We created what I hope is our first of many clinics to help new Canadians, starting with a free vision and hearing clinic. This will help our organization, our community and our country grow healthier and stronger together. So although I have felt the squeeze of our troubled times, and though it may have exhausted my will, the exhaustion was short lived. Got a lot good people around me. A chorus of positive energy as a soft as a whisper but it’s all I need sometimes. Small candles that burn in the darkest places. It’s hard to fathom. I mean I’ve been to cities around the world but this is something immensely different. Dhaka is a city of 16-20 million people. It’s a mass of humanity that breathes and lives like one gigantic organism. There are areas with a density of 100,000 people per square kilometer. It continues to grow at an alarming rate of 4% per year with estimates of 25 million by 2025. It is considered to be the rickshaw capital of the world with approximately 400,000 rickshaws on the street every day. The city’s per capita income is about $3,100 per year, the lowest of the mega cities in the world. Yet amongst the poverty and the density is a bright light. A candle of hope. Here, a modern day Mother Theresa exists… our hostess, Zahida. They say one of the possible origins of the name Dhaka is from the hidden goddess Dhakeshwari. Well we may have found that hidden goddess in Zahida, the leader of our partner in Bangladesh, the SAJIDA Foundation. She welcomed us with open arms and beams with pride when she greets us at the airport and takes us for the tours of their operations. We start with a visit with the low-income families SAJIDA provides business loans for. There are 10 families living in an area the size of two Tim Horton coffee shops. A dozen or more woman are gathered in a small hut waiting for the finances and showing us products that they have made with funding from the business loan. It’s an impressive site. These are empowered women in a developing country. We move then to the hospital and are greeted by familiar faces with big smiles. On the wall of the hospital is a big poster of Team Broken Earth and the SAJIDA Foundation working together during our last visit. We move through the dense streets packed with cars, rickshaws and humanity piled on to each other. There is some order in this chaos. The traffic is so intense that it’s impossible to tell when you are moving and what direction you are inching in. Six lanes deep at times with not enough space to fit a playing card between the next vehicles. The temperature is north of 45 degrees with the humidity but we’re lucky to have some AC. The final trip of the day is the most emotional. We went to visit the “pavement dwellers.” At best guess, there are over 40,000 of these unidentified, homeless, forgotten people. Many are children. I have been to see them before, but this time is no easier. There is a lump in my throat that gets more intense as we walk into the building. On the first floor there are 20 or so adolescent males from 10-13 years old who are being taught basic life skills. They wave and smile. They are all orphans, and live on the streets with no government ID, no recognition that they even exist. In fact, if it wasn’t for our hosts, no one may know they exist at all. They have no one and nothing to call their own, yet they smile and wave. They will leave this building in an hour or so and go to the streets the same way any of our kids would head home after to school. These terrible streets are their homes. There’s a chill that comes with that realization. We go upstairs to the next floor and there are dozens of 5-6 year olds who are all in one room, waiting for us. They have smiles as big as my 5-year-old son’s. They are there because they have been beaten, neglected, or abused. Some have single mothers who are working outside and will be back for them. Some of the young ones are able to stay over night. Others will have to leave and find a dry corner of pavement to lay their heads – if they’re lucky. Lucky. There’s that word again. There’s nothing lucky about this. Five year olds. Orphaned. Abandoned and living on the street. Words cannot do justice to the feeling it creates deep inside of you. A combination of guilt, nervousness, anger, and grief. It’s just not right. We live in the shadow of such gigantic divides. We have to do better. I believe that we are all part of something bigger; we are all in this together. When a five year old lays her head on the pavement in Bangladesh at night, we should all feel it. When an adolescent boy cries for help and no one responds in the streets of Dhaka, we should hear it. Isn’t that what it means to be part of a global community? The five year olds snap me out of it with a song. Five year olds are five year olds no matter where they are. Big smiles, and dancing carefree. It brings a smile to all of our faces. Despite the poverty, despite the fact that some will have to leave the building tonight and come back tomorrow they smile. There is something familiar about their smiles, their eyes. It’s more than childhood innocence. It’s hope. And in hope, they’re richer than any of us. It has been six years since I first traveled to Haiti. Six years since a little girl’s smile changed my life. You may have heard me talk about her before. She was a girl of about twelve who lost her parents in the earthquake and was now the caregiver for her injured grandfather. She provided him with the care he needed. She walked him to the OR and waited patiently in the waiting areas while we fixed his hip. Then she shook my hand with a smile. She carried herself as someone way beyond her young years. It was that smile and the hope in her eyes that compelled me to act. You could see it in her eyes, hope. Hope that there would be better days. Hope that the world could and will be a better place. She would be a young woman now. I’m not sure much has changed, maybe it hasn’t. But more than anything, I want to believe she still has the courage to have that smile and, most importantly, that hope. Yesterday was the first time in a while since I have seen those eyes and that hope in someone else. Despite the adversity, the poverty, the abuse, the chaos, a smile and eyes filled with hope. It’s a testament to people like Zahida, determined to make a difference. To keep that candle of hope burning. We can see it from here. It’s like a lantern. It guides us. It’s carried in the hearts of everyone on Team Broken Earth as we move inch-by-inch closer to the change we all hope is possible in this world. There are routines, memories of direction, things to do? No matter what answer we provided, he responded the same. Frankly, his question stumped us. So how do we know where we are going? This week, we completed something I would have thought impossible two years ago, let alone five years after the earthquake… we conducted a full trauma simulation course in Port-au-Prince, one with all of the trimmings and expertise of any trauma course held anywhere in the world. Team Broken Earth Experts from across Canada, teaching in a combination of didactic and simulation scenarios, the basic approach to trauma care and resuscitating trauma patients. Trauma is the leading cause of years of life lost in the world, it dwarfs illnesses like HIV and TB combined. It takes a perfectly healthy individual and within milliseconds with an incorrect turn in a car or a slip from a ladder, and changes their lives forever. The effects and impact of critically wounded patients is amplified in low and middle income countries, to the point where the World Health Organization and the UN are focusing on trauma in these countries. We have scene first hand young men, women, and children die because there was inadequate treatment, supplies and skills. Of course we take steps to correct that with each trip, but this trip is a huge leap in progress. 80 participants. Nurses and doctors, who need and want the skills to save lives, in a room listening intently and then so enthusiastic to get started. This will change the way hospitals here practice. This one course will be a legacy of changing lives forever. So I guess my answer to Mark and to all of you who have supported us, is this: I don’t know exactly where we are going, none of us can, but we are making a difference at stops along the way, and if the journey is more important than the destination, perhaps that is the purpose. Dr. Allison Furey is one of the original members of Team Broken Earth. Our trip to Haiti, 21 weeks after the earthquake, changed our lives. We left behind two young children (at the time), with a backpack full of DEET, mosquito nets and some Cliff bars, to help during a time of disaster to a nation in need. A few days before we left, I got a little nervous after Andrew finally gave me the details on security, sleeping quarters and armed guards driving our vehicles. But I was reassured that “we would be fine” and not to worry. Getting off the plane, with the thick, hot air hitting us like a wall and walking to the airport, I thought twice about how “fine” we actually would be. We forged on, but nothing could have prepared me for the vision I would encounter of sheer devastation, flattened homes, blatant poverty, piles of rubble, streets of chaos, miles of tent cities, unthinkable scents, helpless souls who had lost loved ones so recently and hopeless eyes in those seeking medical attention at our free clinic and surgical center. I use the word “center” loosely, since it was, after all, a parking lot with blue tarps creating examination rooms. 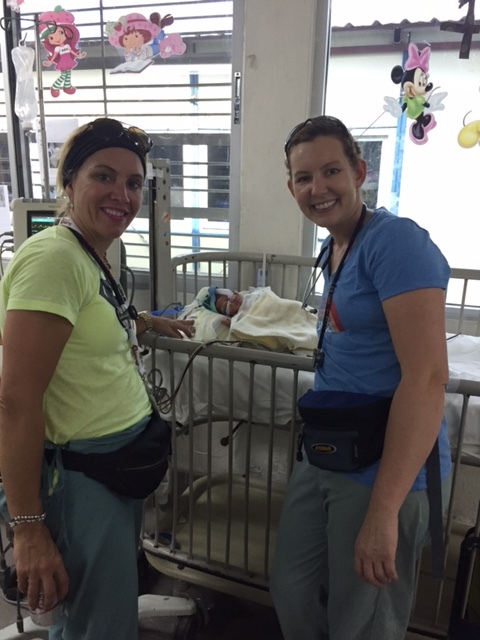 After a long week of hard work, our team was the last mission to provide care in that center. Imagine walking away from a hospital ward full of sick children and adults, with nowhere to go to receive the medical attention that they needed and deserved. I was not prepared for that helpless, guilty emotion. I can still feel the pit in my stomach on the afternoon that we packed up our supplies and equipment after emotional good bye’s and tight hugs of thanks, and simply drove away, trying to hold back my tears. Why was I so upset? Our patients should be upset…but they weren’t…they handed out humble smiles of gratitude and soft waves as we shut the doors. I quickly realized that this was their reality…an unfair reality. A few months was not long enough to help Haiti. Over the last 4 years, from home, I’ve watched Andrew lead more than a dozen missions to Haiti. Every time we started the routine preparation for take off: pack the red bags, buy Kraft dinner, get instant coffee, hand sanitizer, medications, find the Crocs, and prepare for a week away from home. I felt that pit well up inside. A deep desire has sat within me to return to Haiti and be a part of the team that does the work to make a difference in the lives of the Haitian people. 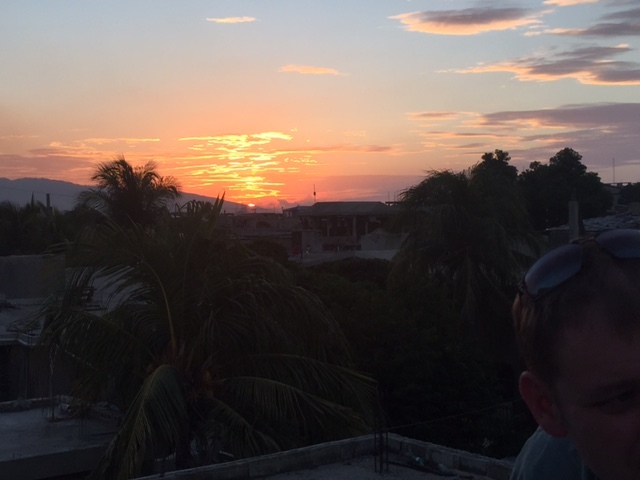 Here I am, 5 years later, reunited with Haiti… The streets are cleared, buildings are new, houses are not piles of rubble… I didn’t even see a tent city between the airport and the hospital! The streets are still bustling with people and street vendors, Tap Tap’s, motorcylists with no helmets and crazy drivers, but that’s normal for Haiti! It’s a relief to see that the surface of the city is improved. That is something Haiti should be proud of. Even though Team Broken Earth is near to my heart, and in my mind, I had created an image of the hospital our teams return to time and time again. I didn’t anticipate the magnitude of overwhelming pride I felt as I crossed through the gates, made so familiar from pictures and videos. We were greeted with open, happy arms by hospital staff, just like family. Team Broken Earth has a true presence at this place, it’s palpable. I know first hand, how much time goes into sustaining the relationship between Team Broken Earth and Haiti (it is more often, than not, our topic of conversation at the supper table). The completion of the new building, housing a new hospital wing is a virtual testament to the hard work and challenges overcome in completing a project of this magnitude in a country like Haiti. I’ve never been so proud. It is an icon of sustainability, growth and advancement in a place where all of that seemed impossible a few short years ago. My first shift in the ER this week was the hardest I’ve ever worked, and much of our efforts were futile, in the end. We were surrounded by death in the emergency room, trauma’s kept coming in, the newborns came in one after another, and the hospital was full, with nowhere to put the sickest children I’ve ever seen. I left that ER after 12 hours, exhausted and drained, frustrated, sad and angry. Sad that this could be the norm here, and accepted. Sad that we had to tell a father that left his wife at the maternity hospital, to rush his newborn to our hospital in hopes that he would live, that we did everything we could, and the baby didn’t make it… through an interpreter. Sad that I watched him weep in the midst of public chaos at the death of his baby, not even old enough to have a name. Angry that I couldn’t do more. Angry that there is such despair in this world and that baby would have lived if he were to be born in Canada. Angry that the only difference between me and that father, is where we were born. I’m not used to losing patients, so it was a good thing that the next day we saved a baby, who I’m happy to report is steadily improving in the PICU, with his mama at his side. I’ll also let you know that one of the best feelings all week was giving a 6 year old boy a pair of Transformer sunglasses… he was just as excited as Mark would be, if I had brought them home to him! Kids are the same, across the world… resilient and happy… and their smiles will melt me, every time! So, Haiti has come a long way in 5 years. Team Broken Earth has evolved from a team providing disaster relief, to a team that provides support and education to a healing country, with a whole lot of potential. I think we’ve reached some gracious health professionals at this hospital… at this point, we are learning from them as much, if not more, than they learn from us. Working and learning together makes us all stronger. Thank you, Team Broken Earth, for providing an avenue to make a truly sustainable difference in a community that needs it so desperately. Wouldn’t it be nice to see the day that Haiti doesn’t need us anymore? I think we’re on our way! 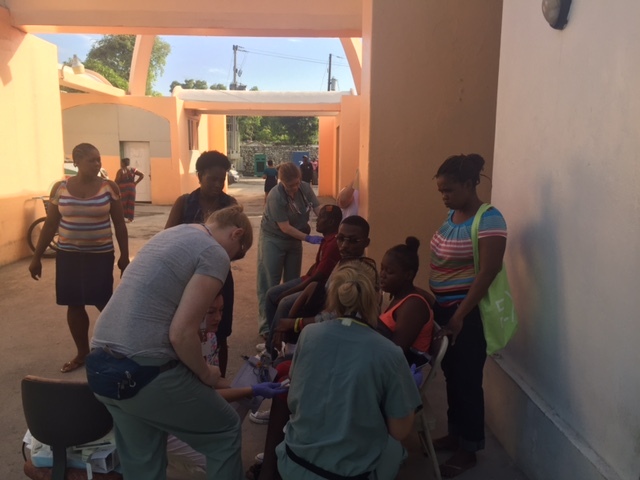 Brad Moss is currently on the ground in Haiti with our NL team on their latest medical mission. “We’re just happy to be here.” These words were spoken by the men of NASA in response to a question by the US media about being chosen as participants in the 1960s Mercury project. Now those words apply to me. As a community-based volunteer, a regular working guy who joined Lions International 12 years ago, I feel like I’ve been asked to join the space program. 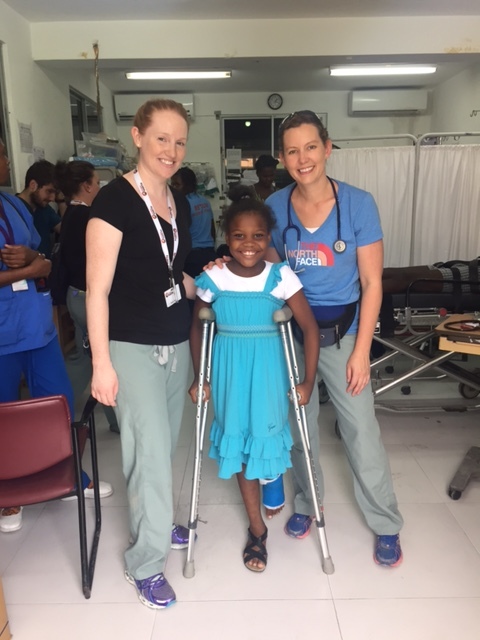 I’m sure you can imagine the mild anxiety associated with a Lion joining a team of physicians, nurses and allied health professionals bound for Haiti for a week of hard work at an over-taxed hospital in downtown Port-au-Prince. Fifteen months of preparation for the first Lions / Broken Earth vision mission has taught me that international relief missions are Herculean tasks. The teleconferences, the packing lists, the inoculations, the supplies, getting everything in a holding pattern at home and at work…it consumes you. Could I really contribute? Would I be accepted by these people with whom I share no professional affiliation? Over the past four days our small team, consisting of Team Broken Earth liaison and human dynamo Meghan Gardner, the generous and jovial Lion Michael Foote, our dedicated and tireless Optometrists Lion (Dr.) Richard Buchanan and Dr. Trudy Metcalfe and myself have screened 448 Haitians for eye diseases and refractive errors. The vast majority have never seen an Optometrist in their lives. Two out of three people screened required a consult. Most of those required glasses from our supply. When we arrive in a yard full of people who have waited hours in the sun for just the chance of seeing an eye doctor there is no grief, no noise, only a stoic and hopeful “bonjour” as we file past to start our day. The hours fly by, with no breaks, as we push ourselves to serve as many of them as possible. It all stops when you see the change in an 8 year old girl’s facial expression when she sees clearly for the first time ever. It’s unforgettable watching a teenage girl leave the yard as she repeatedly takes the glasses off and puts them on again – you couldn’t buy that feeling if you tried. In the moment, these rewards are very short-lived. Soak it in and on to the next patient from Mike’s visual acuity queue. My role is to take portable auto-refractions and make a cluster of decisions with Mike about whether a referral to Rick and Trudy is necessary. Without their professional know-how none of this would be taking place. Likewise, none of this would be taking place without the unequivocal support of the Lions of District N4 and our home Clubs in Portugal Cove – St. Philips, Old Perlican and Springdale, who’ve put their trust and hard – earned money into this cause. To them, I say we are doing our level best here every day to represent the Lions of Newfoundland and Labrador. This year, our International Lions President, Dr. Jitsuhiro Yamada from Japan, chose the words Dignity, Humanity and Harmony as his motto for 2015. I can’t think of better words to describe the work the entire TBE/Lions group is aspiring to do here. I’ve never been prouder to be a Lion, and I know the same goes for Mike and Rick. As for Broken Earth: as Lions we remain in awe of this remarkable homegrown humanitarian effort. Take it from me… they are doing our province and its people proud. My resolve to strengthen the partnership between our great organizations is steely. The collegiality, encouragement and recognition of our work by the medical team is appreciated more than any of them realize. I’m really not sure I’ve ever met more dedicated professionals in my life. What an inspiring and fun group to be around. Without knowing it, they are exuding that motto of Dignity, Harmony and Humanity every waking minute. Hey, we’re just happy to be here.